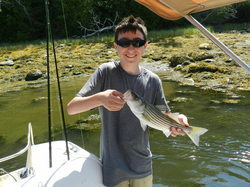 Maine 207-385-9680 June thru Sept.
Verona Island Charters is a private charter, for you to enjoy the pristine Penobscot River and Bay in 2019 ,Stripers are moving into the Mighty Penobscot River with the 2019 season just around the corner so make your reservations now to secure the best dates and times , also for 2019 follow me on Facebook , Twitter and Instagram (fishingverona) for all updates on fishing and sight seeing for 2019 !!!! Try your hand at light tackle fishing ,watching Eagles,Ospreys and other sea birds fledging thier nests , Seals sunning themselfs on the ledges and rocky outcrops and just enjoying the Penobscot River and Bay !!! Let me help you make some memories with your friends and family .